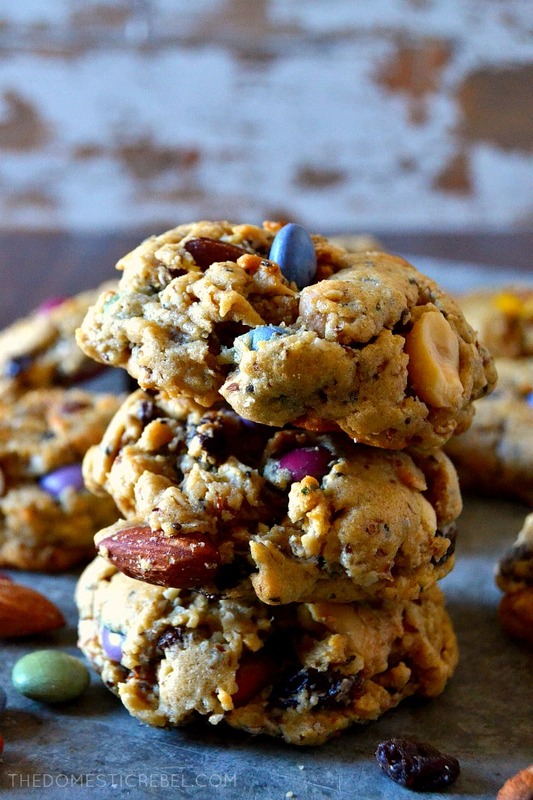 Packed with good-for-you ingredients, these hearty Trail Mix Energy Cookies will keep you going throughout the day! Easy to make, delicious, and great for snacks on the go! Now, you know that I’m on my “healthy” kick… but I absolutely could not fully commit to the dark side and make like, kale stuff. I just refuse to. 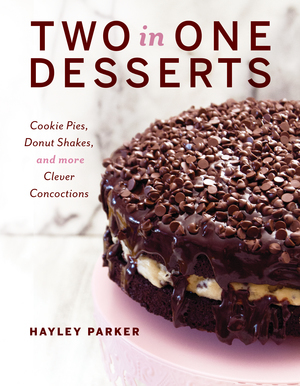 So you know I had to make a cookie recipe that could still be considered better-for-you than my usual offerings. 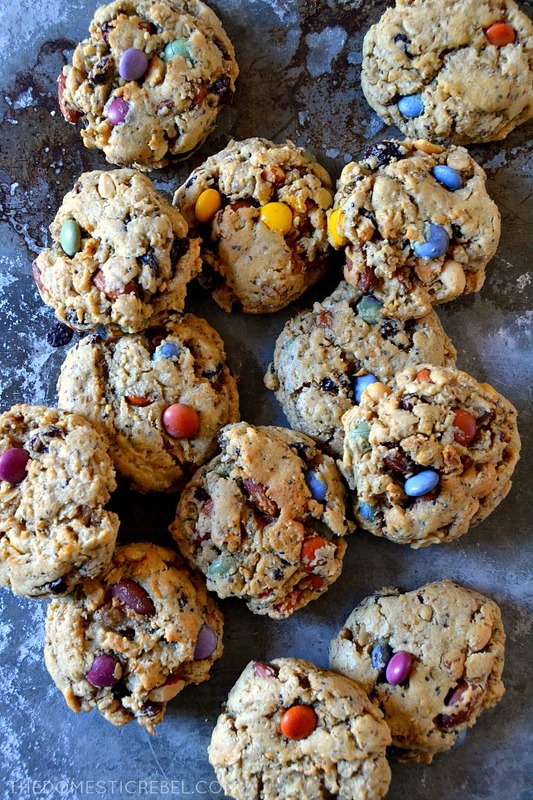 Enter: these Trail Mix Cookies. They are made with better-for-you ingredients without tasting like bird food. 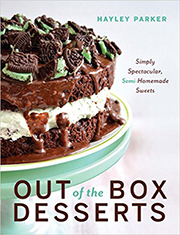 And dare I say, they’re just as good as any other sinful cookie offering on my blog! The base for these cookies comes from my Thick & Chewy Monster Cookie recipe which is a fan favorite because they’re soft, huge and ultra thick… just like a cookie should be. However, I tweaked some things with the recipe so it is a little healthier than the normal version. To give these an energizing “kick”, I added in ground flaxseed meal and some chia seeds. Flaxseed is a wonderful little guy that boasts high counts of omega-3s and lots of good fiber to keep you feeling fuller for longer. They also contain lignans which provide antioxidant benefits. Score! Chia seeds, like the flaxseed, also boast lots of omega-3s, good fiber, and even iron and calcium while being rich in antioxidants. 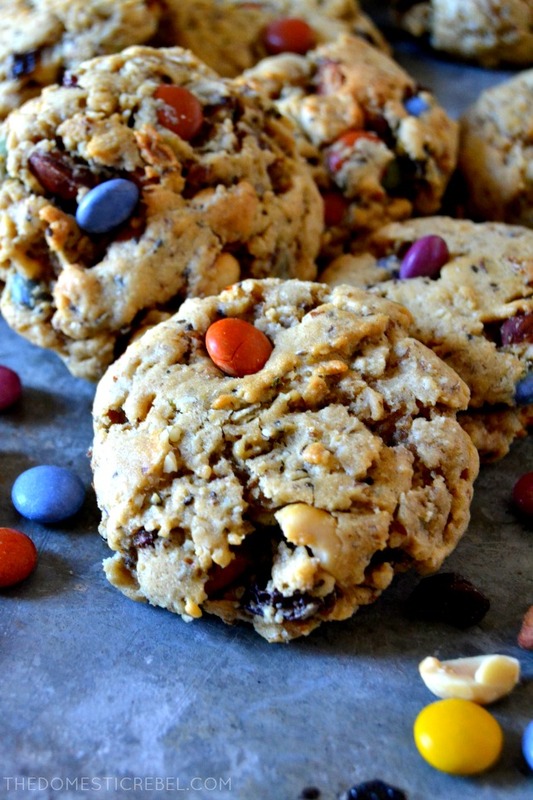 And to switch things up from my Monster Cookie recipe, I used trail mix for flavor and to keep ya satiated as you climb the nearest mountain or conquer your New Year’s resolutions. The particular mix I found at Whole Foods had almonds, peanuts, candy-coated chocolate pieces, and raisins, but most trail mixes should work just fine! The result is a super thick, ultra chewy cookie PACKED with healthier ingredients to keep you satisfied, with zero kale in sight. 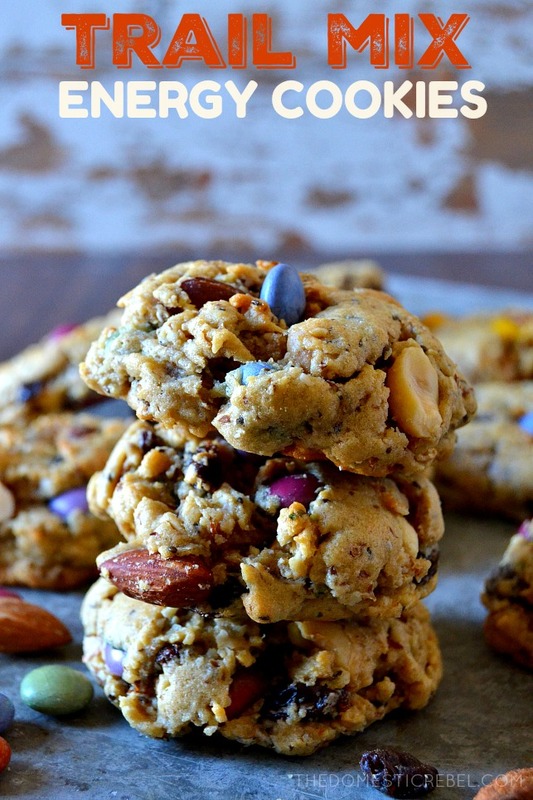 These Trail Mix Cookies are fantastic sources of antioxidants, omega-3s and healthful ingredients to give you energy and keep you fuller for longer! In the bowl of a stand mixer, cream together the butter and peanut butter with the paddle attachment until combined, about 1 minute. Beat in both sugars until well blended, followed by the eggs, one at a time, and then the vanilla. Add in the cornstarch, baking soda, salt and flour and beat until just barely combined. Lastly, stir in the oats, flaxseed meal, chia seeds and trail mix with a spoon or spatula until combined. Cover and chill for at least 2 hours, up to overnight. 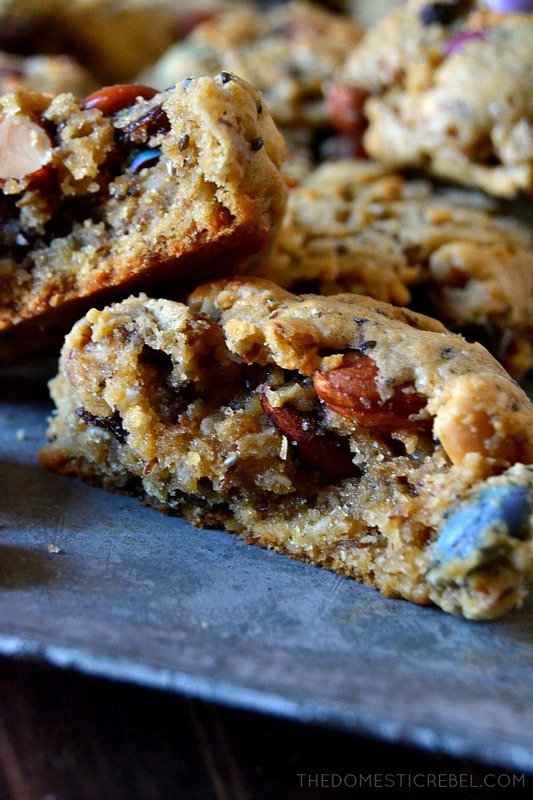 Packed with flavor, fiber, and delicious ingredients, you won’t feel guilty about these tasty cookies! I love “healthy-ish” cookies! These look wonderful. 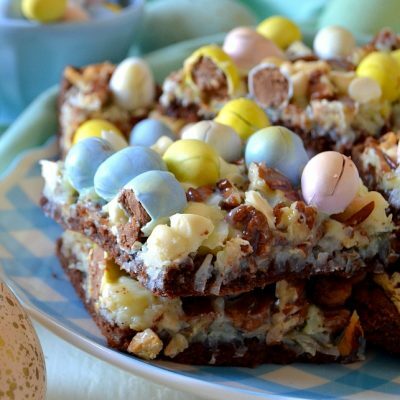 Love the nutty and healthy flavors with a little bit of decadence.